The Asia/Pacific Group on Money Laundering (APG) says that “sound, risk-based supervision” is being undertaken in Macau’s gaming sector. But there was also a need for better understanding among the Macau VIP gambling promoters of the recently updated local rules on money laundering and terrorism financing risk, acknowledged a Wednesday press statement issued by Macau’s Financial Intelligence Office. The office was commenting on the APG assessment – known as a mutual evaluation report – that was based on a December 2016 visit to the city by a panel of APG-assigned experts. The report acknowledged Macau’s overall efforts in combatting money laundering, terrorist financing and “proliferation financing” – i.e., money used to spread the availability around the world of nuclear, chemical or biological weapons. 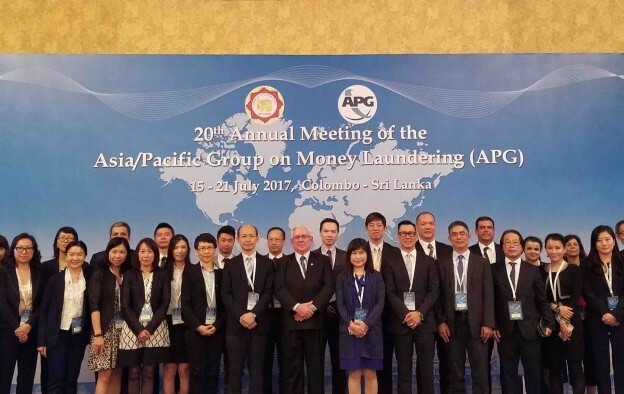 According to Wednesday’s announcement, APG had adopted that day at its annual meeting held in Sri Lanka (pictured), its latest report on Macau. The meeting was attended by Paulo Martins Chan, director of Macau’s casino regulator, the Gaming Inspection and Coordination Bureau, which is also known as DICJ. “This 2017 Asia/Pacific Group of Money Laundering/Group of International Finance Centre Supervisors Mutual Evaluation Report (MER) provides a solid and authoritative proof of the Macau SAR’s [Special Administrative Region’s] strong efforts by both the public and private sectors in the prevention and fight against money laundering, terrorist financing and proliferation financing,” the Financial Intelligence Office stated. Citing the assessment report, the office said “sound risk-based supervision” was being undertaken in the two most significant sectors – casinos, supervised by the gaming bureau – and the non-gaming financial sector, overseen by the Monetary Authority of Macau. “The [APG] assessment team acknowledges that implementation of terrorist financing [sanctions] and proliferation financing-related sanctions is generally good within the context of the Macau SAR’s risks, and the banking sector has a high level of awareness of their obligations to comply with United Nations’ sanctions lists as does the gaming sector,” the intelligence office wrote in the press statement. The assessment report also acknowledged that the casino regulator had applied anti-money laundering measures that included licensing and test requirements on junket promoters and their collaborators. The Financial Intelligence Office further stated the report highlighted the gaming bureau’s revision last year of the anti-money laundering rules for the gaming sector, enacted on May 13. “Nevertheless, the Macau SAR Government acknowledge that the understanding of the updated anti-money laundering/counter terrorist financing obligations and money laundering/terrorist financing risks in the junket promoter sector could be further improved,” the Financial Intelligence Office’s press statement said. It added: “The Macau SAR Government will continue to improve and strengthen the supervision on the gaming sector, and require its continuous attention to and compliance with the international standards of anti-money laundering and counter-financing of terrorism”. According to the APG’s website, the December mutual evaluation involved the assessment team conducting a series of meetings with Macau government authorities and representatives from the private sector. The mutual evaluation focused on technical compliance with the standards of the Paris-based Financial Action Task Force (FATF) as well as the effectiveness of Macau’s work on anti-money laundering and combatting the financing of terrorism. The APG, which describes itself as an “autonomous and collaborative” international organisation, was founded in 1997 in Bangkok, Thailand. It consists of 41 members and a number of international and regional observers. Macau became a member of APG in 2001.